I hope that clears up the picture a bit. I am sick and don't feel like making it again, ha ha! I tried to make this as streamlined as possible. If there is one I missed- please let me know below! 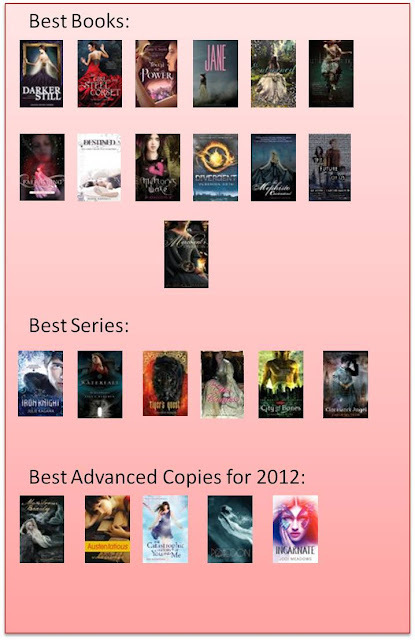 It is a little hard to see the titles, but the ones that I recognized the cover art, I agree with your picks! You've got one of my faves: Clockwork Angel. Loved it!! Can't wait to sink my teeth into Clockwork Prince. It's waiting, patiently, at home. Yippee! I have been reading the Unbecoming and I'm a little wary because I legit have no clue what its about or where it is going. I see it on a lot of top lists though ! I agree with everything! :D End of story. I loved Jane, perhaps a bit more than the original. While Jane Eyre is a classic and really good, it was also extremely dramatic and depressing for my sensible self.